Home heating systems consume as much as 50 percent of the energy used in the average home, according to the American Council for an Energy Efficient Economy, or ACEEE. Heating systems are vital for keeping your family warm and comfortable each winter. When it comes it choosing a heating system, options like heat pumps and propane-powered furnaces can have a major impact on utility bills and energy consumption. Heat pumps draw heat energy from the air outside and use it to heat the home. They use a refrigerant system to capture outdoor heat, then transfer it indoors through a series of copper pipes or coils. An indoor fan blows on the copper coils to distribute heat energy through the home. The cooled refrigerant then passes back outside to collect more heat. In the summer, the refrigerant cycle can be reversed to extract heat from the home and exhaust it outdoors, thereby keeping the inside of the house cool and comfortable. According to Energy Savers, heat pumps are most effective in mild or warm climate zones and are not often an efficient choice for very cold areas. 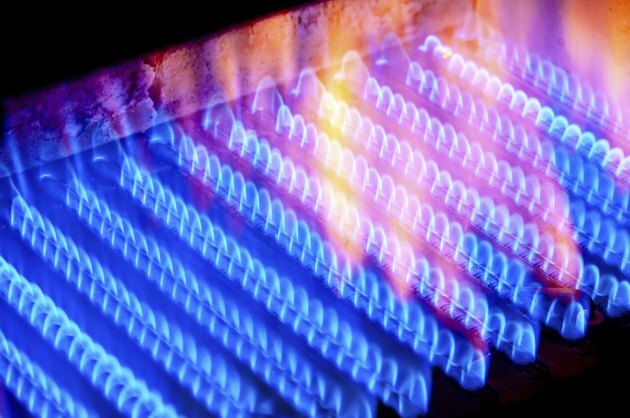 Propane furnaces, on the other hand, rely on a standard combustion process to generate heat energy within the furnace itself. Unlike heat pumps, they can only be used for heating, though a separate propane air conditioning system can be used for cooling. A propane furnace relies on liquid propane for energy, which is stored in a large tank. Homeowners who choose to heat with propane must have these tanks refilled each season by a propane delivery service. Air-source heat pumps are fueled by electricity, but actually work differently than a standard electric-resistance heater. Instead of transforming electrical energy into heat, which is a highly inefficient process, they rely on electricity only to power fans and blowers. The refrigerant simply collects existing heat from outside during the winter or inside the home during the summer. Electricity is only used to power fans and blowers to exhaust this heat from the system. The efficiency of your home heating system can have a major impact on your family's health. Systems with a high efficiency rating consume fewer fossil fuels. By reducing your consumption of fossil fuels, you help reduce air and water pollution while reducing the impact of global warming. Heat pump efficiency can be measured using the heating season performance factor, or HSPF. According to Energy Savers, the most efficient heat pumps have an HSPF between eight and 10. The higher this value, the greater the efficiency. The efficiency of a propane furnace can be measured using the annual fuel utilization efficiency, or AFUE rating. According to Energy Savers, AFUE ratings for these units range from 78 to 97 percent. One of the primary advantages of a heat pump is its ability to be used year round. It also produces nearly twice as much energy as it consumes, according to Energy Savers. According to the Propane Gas Association of New England, a propane furnace produces heat at 120 degrees Fahrenheit, while heat pumps produce heat at around 95 degrees Fahrenheit. This makes a furnace the superior choice for very cold climate zones. Propane is also a clean-burning fuel, and according to Energy Savers, contributes less to air pollution than the coal used for electricity production. When comparing the operating costs of heat pumps and furnaces, compare cost per unit of heat, or BTU, rather than cost of fuel. Iowa State University, or ISU, recommends finding the cost per 1,000,000 BTUs using this formula: Fuel Quantity times Fuel Price Divided by Efficiency Rating. According to ISU, you'd need 11.11 gallons of propane or 293 kilowatt-hours--kwh--of electricity to generate one million BTUs of heat. ISU assumes propane costs $1.30 per gallon and electricity costs $0.095 per kwh. Before plugging in efficiency information, convert the percentage to a decimal. According to Energy Savers, the average heat pump is 200 percent efficient, or 2.0, while the minimum propane furnace is 78 percent efficient, or 0.78. Using this formula, one million BTUs from a propane furnace cost $18.52, while the same million BTUs of heat from a heat pump cost $13.92. By recalculating these prices using fuel costs in your area, you can make a true apples-to-apples cost comparison.